Boscastle is a pretty village arranged on a long street climbing steeply through woodland. The Valency and Jordan rivers meet incoming tides with dramatic effect. At the Harbour Entrance is the 'Boscastle Blowhole', Which divers are seen exploring in the summer season. 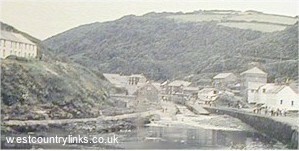 Although Boscastle suffered serious flooding, the local people bravely gathered together and by the following season this pretty harbour with its picturesque buildings, craft shops, pubs and tea rooms had turned itself around ready for the many tourists who flock to visit. Visit the quaint "Olde Worlde" local pubs, Napoleon and Cob Webs, full of charm and friendly staff to greet you. The harbour is difficult to enter unless the sea is calm but Boscastle provides one of the only havens along that particular long stretch of coast for boats to shelter during storms. The local seal population suffered in the past being hunted, but this industry is now under control. Walks along the coast give breathtaking views.